Even during a precarious political and economic time world-wise, high-end jewelry brands continue to experience sales growth. Euromonitor International (a leading market research firm) recently reported that 2017 will yield a total of $37.8 billion spent in the luxury jewelry market. Wow. Many of these established brands have a long history of popularity, with decades worth of marketing behind them. And that’s to say nothing of their amazing craftsmanship. WHAT ARE THE TOP 10 DESIGNER JEWELRY BRANDS OF 2017? If there are any of well-known designer pieces that really speak to you, speak to us! We specialize in custom design that takes elements of what you like and combine them into the jewelry of your dreams. 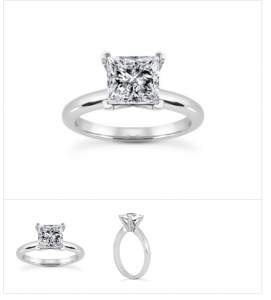 Classic Tiffany style solitaire engagement ring for a square stone (setting only, does not include center stone).